If you want to be prepared in your search for Haena homes for sale, you should register with Anne Eliason. By signing up, you'll get access to additional listing photos and details, and you can have homes that meet your custom needs emailed driectly to you. That way you'll have a head start on other home buyers. Why Choose to Buy a Haena, Kauai Home? Sitting on the northern coast of Kauai near Tunnels Beach and Wainiha, the area is a 38-mile stretch of Highway 56 and is an essential part of local lore, which states that the sea caves were formed by the fire goddess Pele's quest for a new home in Haena. Situated along the Na Pali Coast, Haena offers stunning panoramas of the turquoise blue ocean, the coral reef and breakwater, as well as the rugged and green mountains. The beautiful Haena, Kauai homes for sale have been built with impeccable craftsmanship. No detail has been left untouched. The luxury properties in this community make any buyer feel lucky to call this place home. Haena is also home to many vacationers looking for a luxurious and exclusive property. Additionally, the homes for sale are surrounded by large, beautiful palm trees and colossal shrubbery. Lush landscapes and large properties guarantee residents the seclusion they crave. In addition to privacy, Haena properties for sale boast large floor to ceiling windows, modernized interiors, and tropical details, offering residents a balance of a contemporary home and Hawaiian charm. Many of the homes are overlooking the water: ocean, bluffs and secluded beaches — making these properties some of most sought-after real estate on Kauai. Custom built estates in Haena are dream retreats for buyers looking for a vacation home. Tennis courts, infinity pools, and large outdoor patios are just a few of the amenities these homes are equipped with that make these properties great for entertaining. Most of the homes for sale in Haena include custom cabinetry, ultra-modern interior technologies, and contemporary finishings that add to their exclusivity. Pristine beaches, private tree-lined driveways, and cloistered gated properties give residents the enchanting Hawaiian home they dream about. Nestled away from the busy areas of Kauai and only a short distance to Wainiha and Hanalei, Haena is one of the top spots in Kauai to have an outdoor adventure. It's not a surprise considering the area has such a large amount of natural beauty and provides many opportunities for seclusion. Being so remote and beautiful, Haena is an amazing place to hike or explore nature. Some of the most popular activities that you can enjoy as a Haena resident include surfing in the winter, and in the summer, swimming, hiking, or mountain biking. There are also five beautiful and scenic botanical gardens that are located either in or near Haena including the Limahula Garden, which has been named National Botanical Garden of the Year previously and has over 16 acres of lush gardens and expansive rainforest. Visiting Haena State Park Residents from all over the island enjoy discovering the “end of the road,” as Haena State Park is commonly known. As the northernmost road on Kauai, before reaching the Na Pali coast, Haena State Park offers activities for every member of the family. Trails lead to park beaches with archeological sites and to 4,000-year-old sea caves. Consequently, Haena real estate will not only provide you with the Hawaiian home of your dreams but also with the adventures and memories that will last a lifetime. 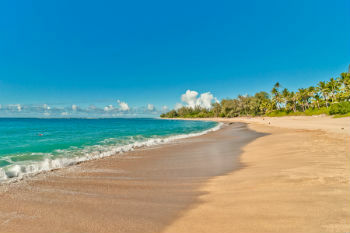 If you're interested in exploring Haena, Kauai real estate, contact Anne Eliason now! Let the Kauai real estate professional help you find your dream home today. Listing information last updated on April 23rd, 2019 at 3:37am CDT.